Sunview Retreat - Absolute Value for money with Free Wifi and private BBQ areas. The modern, warm separate studio has a rural outlook, is surrounded by quality homes all with large sections. It is close to traffic routes, beaches, cycleways, arts, crafts, markets, Saxton Sports Stadium, cafe's, wineries, the Richmond Shopping Centre and it is a great base to explore the regions many attractions. - Everything you could need, a quiet restful retreat, modern, clean, huge bed plus a great shower. - You have an amazing location here, so close to town yet you feel miles away! The Studio has Mobile Phone Coverage. Free unlimited Wifi. The studio has all day sun, two outdoor dining/relaxing areas with tables, chairs to follow the sun or shade. You have your own BBQ so relax and enjoy! Ideal for guests looking for, reasonable tariff, short or long term stays. You have your own washing Machine, tub, iron, ironing board and clothes airing rack located in the adjoining garage. Additional $2 charge per hour for the use of the dryer. Microwave, small on bench grill/oven. Double plug in elements and an electric frypan for cooking. Full size Fridge/Freezer, kitchen sink and an extra food preparation table. 32 inch Flat screen TV with Freeview and DVD Player. This is a wonderful central location to explore the greater Nelson region from. 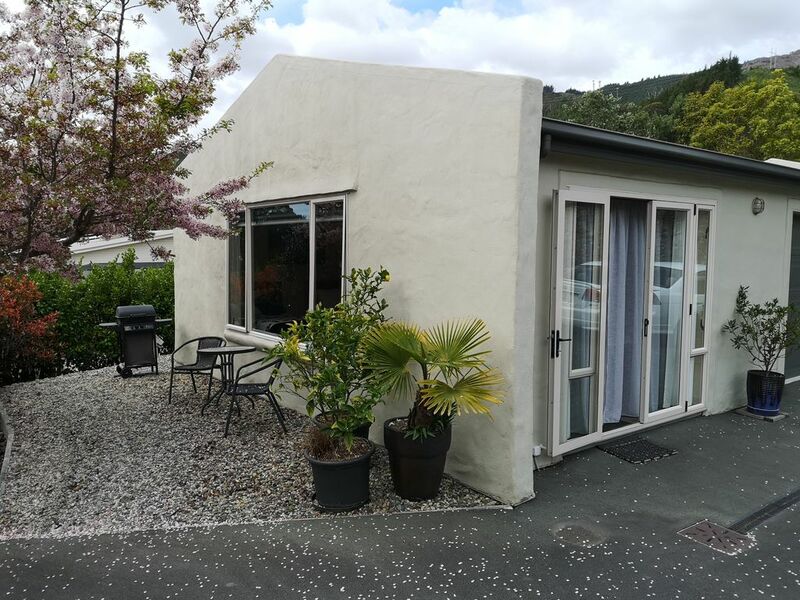 45 minutes to Kaiteriteri and Abel Tasman National Park.. 1 hour to Nelson Lakes National Park and Kahurangi National Park. 2 hours to Rainbow Skifield, Golden Bay, Marlborough or Picton. Extensive information folders include local and regional attractions, wine tasting, cafes, walking tracks, cycle trails and National Parks. New comfortable beds which can be arranged as a Superking size or twin singles. ANZAC, Easter and Labour Weekends are charged at peak tariff $90 per night. There may be a minimum number of nights 3 - 10 required at certain times of the year such as Public Holiday Weekends and Christmas. Although our booking calender is blocked for the Peak summer season it may be available but we have a minimum stay of 10 nights from 26th December to 5th January at $90 per night. Please send us an enquiry if you are interested. I have lived in the wonderful Nelson/Tasman region all of my life where we own Holiday Homes in both Richmond and Golden Bay. (Ligar Bay) I am keen on the outdoors hiking and mountain biking but I love the beaches, restaurants, shops and wineries also. We know the area well and can advise you of the best areas to visit to make the most of your stay. Sunview Retreat is set on 3/4 of an acre in a rural residential area with a quiet, peaceful outlook. Although we are semi rural we are only a 5 minute drive, or a 3.3 km walk on back roads and walkways to the Richmond CBD but you would think you are miles away. So close but so quiet. Our neighbours are all on similar sized sections and the Studio is in a completely separate building to our house. The Studio has two outdoor living areas to follow the sun or shade. Breakfast behind the studio in the morning sun then BBQ for dinner under the shade of the flowering Cherry Tree when it's hot. We have an in ground swimming pool that you are welcome to use. It is located in our outdoor living space but you are welcome to sue it. There is off road parking for one car. Bikes can be stored in the garage adjoining the Studio. There is a washing machine, Laundry tub, iron, ironing board and clothes airing rack for the studio in the adjoining garage. Also a clothes dryer but we do ask for $2 per hour for the use of this. We are located in a peaceful rural residential area with sheep paddocks across the quiet road. We are only 5 minutes drive to the Richmond shops or a 3km walk through walkways. Electric Heater easily heats the room. All linen provided. Sheets, pillows, pillowslips. Duvet, cover and extra warm blankets provided. Kitchen tea towel. In the adjoining garage there is a washing machine, laundry tub, iron, ironing board and clothes airing rack for Studio guests. Around the back of the Studio there is a small washing line. There is an additional charge of $2 per hours for the use of this. Off Street parking on the driveway near the Studio for one car. Bath Towels and face cloths plus bath mat and hand towel. Please bring your own swimming/beach towels. Small on bench grill oven plus two plug in elements but not a full size stove/oven. Kitchen dishes and utensils for four settings. Well stocked kitchen for cooking equipment, cutlery and crockery. Kitchenette with extra fold away table for storage and food preparation if required. 32 inch flat screen TV with Freeview TV and DVD player. There are a few DVD's. Outdoor living areas to follow the sun/shade. Outside only - there is no shelter in bad weather. We have a swimming pool on the property which guests are welcome to share with the owners. We had a lovely time, relaxing at Sunview, and found it to be quite central to our needs. We found the bed a bit on the firm side for us, and getting round the sides of the bed to be a bit narrow, but otherwise our stay was comfortable. A lovely property but only of use for those with a car. Wonderful stay. Well. Equiled and very neat. Lovely hosts. Will definitely book again. Thank you. Lovely gardens, very well situated in a residential area a few kms from the city of Richmond, very convenient indeed. This immaculate little place is perfect for exploring the region, it has everything you need, including peace and quiet. The Nelson Region is a sought after tourist location as the attractions are all so close. There are three National Parks within one hour drive of the Studio. Abel Tasman National Park, Nelson Lakes National Park and Kahurangi National Park.